The American Board of Internal Medicine (ABIM) today announced plans to begin offering a new Maintenance of Certification (MOC) assessment option in January 2018. 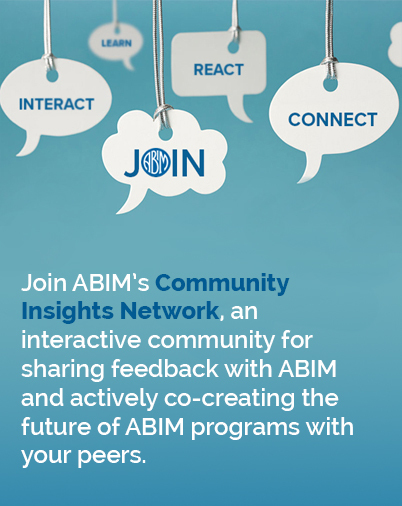 ABIM’s current 10-year exam will remain available as a second assessment option, and both options will reflect the input ABIM has received from physicians and medical societies over the past year. Read the news release for more information. During the coming months, we will continue to work with physicians and societies to refine the assessment options, and we expect to provide more specific details no later than December 31, 2016. We know you might have questions, so we created FAQ that we hope you will find helpful. We continue to welcome your input and will feature regular blog updates about our progress. Feel free to email me with your thoughts and ideas.